Hot on the heels of a post about veggie chips, I am here to write about SunChips. First off, let me clarify that SunChips are a specific brand of chips. Veggie chips are a type of chips that encompasses a variety of chips that market themselves as being made of or taste like vegetables. Unlike veggie chips, SunChips get my seal of approval in terms of healthiness because they are made of whole corn, whole wheat, and whole oat flour. All these wholesome ingredients result in 18 grams of whole grains and 3 grams of fiber. That is nearly three times the amount of fiber found in a bag of veggie chips. Whole grains are the kinds of carbohydrates you want because they provide energy for a longer duration, since they do not get converted into usable energy as quickly as refined flour is. Fiber is also great for powering your digestive system and helping all that food you eat go through your body. 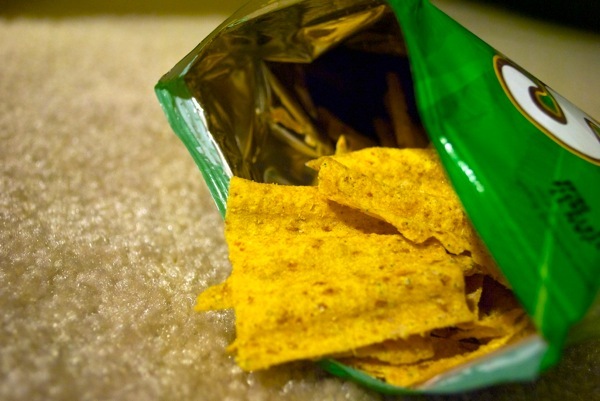 The amount of fat found in SunChips is comparable to the amount of fat found in veggie chips however. Not only are they more healthy, SunChips do not compromise on flavor and texture either. They are thin, crisp, and crunchy—like any other chip. The variety of flavors ranging from garden salsa to peppercorn ranch also plays in the SunChip lineup’s favor. On the other hand, veggie chip flavors are limited to just veggies. Bottom line is: SunChips > Veggie chips > Plain potato chip. On a side note, I recently stumbled across this article by Roz Chast of The New Yorker in which Chast goes on a rant about bananas for their packaging. Here’s a quote. The main problem I have with the banana is its packaging. Whoever came up with it must have been running out of time and went with his or her first idea, which sometimes works out well, but sometimes you need to step away from the drawing board. So, in the place inside your head where you picture things, imagine someone starting to eat a banana. The person breaks open the peel, which always smooshes the top of the banana a little bit. That’s O.K. Whatever. But watch how the peel starts to drape over the hand.